I've been wanting to try this since “PurpleRoses” posted – it makes a LOT of soup, with a LOT of cheese (and bacon and onion and... ) so when once again my doc advised me to up my calcium intake, I had my perfect excuse! 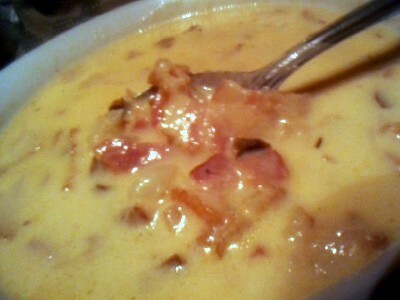 HoChunk Rainbow Casino's Cheese Soup is really pretty simple to make, once you get past all the chopping. Let the bacon and onions go for at least a half hour – the bacon does NOT get crisp, but by then all the moisture from the onion will have steamed off. I started those in my dutch oven – definitely not large enough for the entire pot of soup, but I could crank the heat a little higher than with my stock pot, and this gave me a solid start. Transfer this aromatic mixture into the stock pot, add the potatoes, seasoning... and then time for an educated guess. “Four large cans” did not give me a warm feeling, so by eying my blend, I ended up with 12 cups, or 3 quarts of chicken stock (you could get by with even a cup or two less, especially if you want a more velvety soup). So it's simply add your cheese, melt, add your cream, bring just to a boil, toss in your cooked wild rice, and done. This gets thicker as it cools, and while most of the “goodies” sink to the bottom, they are there and are AWESOME! The smokiness of the bacon, the sweetness of the onion, creamy potatoes, slightly chewy rice... Now THIS is a keeper!